Last month I danced with fear many many times. To different music, beats fast and slow, and with lots of fancy foot steps – not to mention all the homely ball gowns! It was like a ‘dancing with the stars in the dark' series. I am not usually an F(ear)Bomb person, so it caught me by surprise to be swept off my feet by this emotional waltz. Plus, I have no rhythm, so I insisted on stopping the music. Once it got quiet I recognized that my shadow dance partner was swirling all around, looming around me in countless conversations with others. Through the Law of Attraction, not only was I personally feeling fear creep into my own mind, but I was also hearing and seeing others around me stuck in the same self-limiting fear cycle. Like with any dark force, I knew I had to shine a bright neon light towards it in order to take away its power. I knew that fear had no right to my dance floor. Here is what I learned. Fear is an unpleasant emotion caused by thoughts and beliefs that someone or something is dangerous. The thoughts sound like “what if” and look like “worse case scenarios.” So the thinking is first, followed by the emotional response, followed by the reaction to those emotions (either conscious or unconscious). Fear can paralyze you like a tranquilizer drug. It affects your brain AND body. It moves through your blood stream and creates a real physical reaction, making it hard to breathe or even move. True, sometimes fear makes you MOVE FAST, like when a lion is chasing you. In today's modern society most of us don’t live in wild cat country, so instead we freeze. We let fear stop us in our tracks and form an ice cold bubble around our heart. Once fear is inside you, it flows out of your own body & mouth into actions and words that negatively influence the environment and others around you. Therefore actually attracting the exact response, negative energy and things you do not want! Once I really let all that sink in – and I have honestly been writing this blog post for over 30 days now – I understood deep in my bones that fear is illogical and toxic. I could then also see how silly we humans are as I examined what people around me were afraid of. Getting hurt by others or the environment as we move thru life. Not having any and having too much money. Loving too much and not being loved enough. Losing an old crappy job or trying to get a new unknown one. Searching for a new partner or letting go of an old one. Working your body too hard or not hard enough for health & fitness. Letting old dreams die and birthing new ones. Fear of letting others down and even worse letting down yourself. Fear of being sober, honest or open and fear of lies or being numb. Losing all your possessions or drowning in meaningless things. Fear of failure but even worse, fear of success and worthiness. Determined to reject fear as one of my daily thoughts or emotions, I knew that awareness was the first defense. Watching, listening, feeling for when that dark dirty dancer wisps on by me or is swing dancing with those around me. Then paying attention to the energy, sounds and visuals I expose myself to daily to ensure they do not generate fearful thoughts or feelings. My willingness to have honest open conversations with those I care about around fear has also been a game changer. 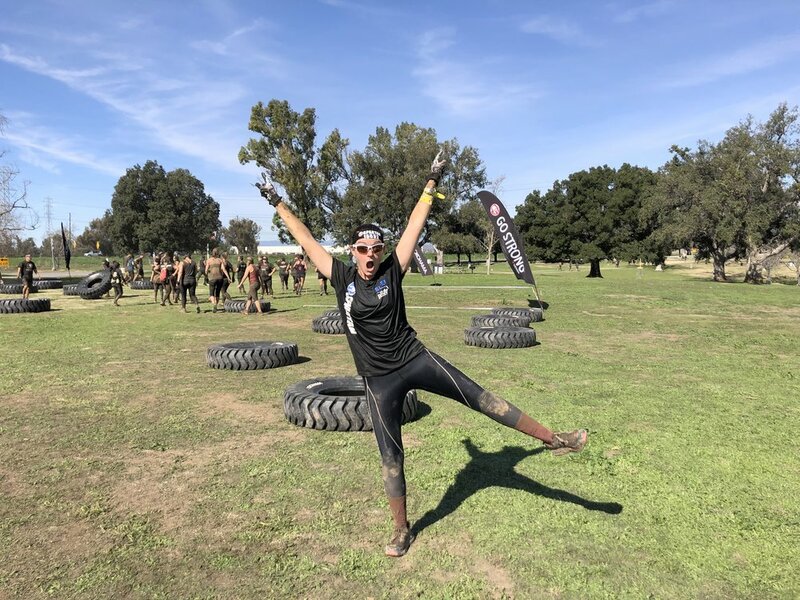 Knowing all this has given me my strength back to look fear in the face and even create “Fear Challenges” where, in a safe environment, I push to do the things that scare me and make me really uncomfortable so that my potential can get some regular exercise too. I also plan situations each week that get me hanging around brave badass adventurous people so that my definition of ‘comfortable’ is redefined and truly means always growing instead of remaining stagnant. I confess it has taken me 50 years to learn the hard way but I also fully embrace I am nowhere near done evolving yet. I used to be afraid of being alone and now I crave it. I used to fear reaching out and being rejected but now I leap at opportunities to hug strangers. Professional and business risk sound scary? Hell, I live and breathe that world 24/7 nowadays. For fun and exercise on weekends I go on outdoor adventures where I could get lost, get wet, go hungry, be too cold or too hot or possibly run into a wild animal but I say BRING IT ON. Why? Because when I quiet the music of the world, take off the dancing shoes and instead listen to my deep wise soul...all I hear is the roar of courage. 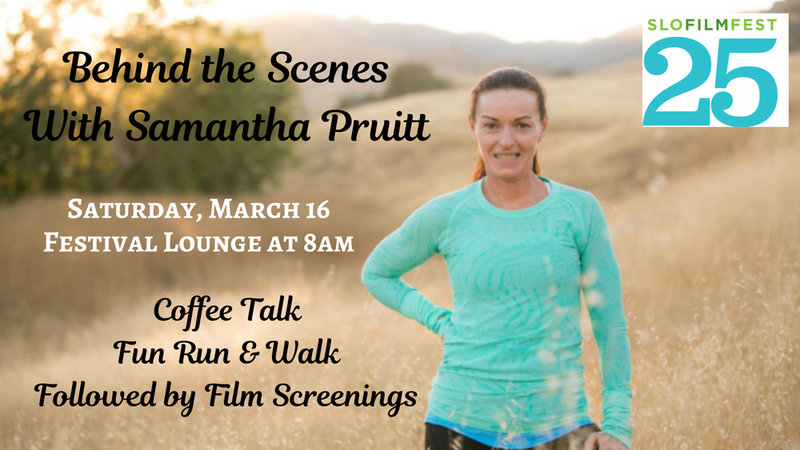 Get "Behind the Scenes" with the Race SLO founder and ultra-runner Samantha Pruitt at the San Luis Obispo International Film Festival on March 16, 2019! 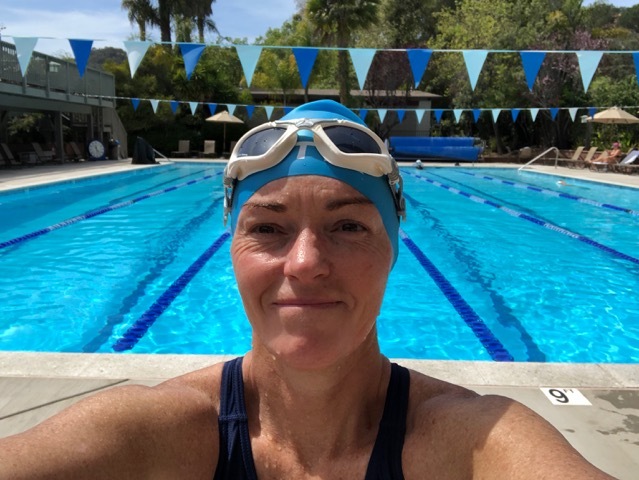 Join Samantha and the San Luis Distance Club for a FREE community coffee talk at 8am in the Festival Lounge, and then head out for a fun walk/run through the streets of San Luis Obispo. Finish at the Downtown Cinemas just in time for the 10:15am screening of the Faces of Adventure film about Samantha (by Adventure Aide), Running Man of Pasadena and Accidental Climber (tickets at the door). All levels of walkers and runners are welcome! Plan on 30min talk/ 60min workout. Presented by City of San Luis Obispo. Sponsored by BlackHorse Espresso and Bakery, San Luis Distance Club and Race SLO. Race SLO founder Samantha Pruitt in conversation with lululemon about powerful women and leadership on International Women’s Day. What does it mean to lead powerfully and authentically? For me, authentic leadership can only come from a place of deep life purpose. One’s unique purpose must be dug into, unearthed and harvested in order to use it as a powerful fuel for change and growth. Think of your life and personal leadership as your own limitless garden. You can make it big, small, wild or fancy, full of veggies-fruit or flowers, you can use it to feed yourself, your family or the entire community. However, left unattended, it will grow weeds, be unproductive and eventually die. Additionally, there are seasons to your leadership garden. Life's calendar and climate will affect what you plant, what you reap and how both your body and mind will respond to each harvest. Knowing and adapting to this natural cycle helps you understand that YOU hold the power to your own harvest. Understanding this ever-changing personal power allows you the freedom to explore your potential as life’s gardener without judgement or fear. Lastly, sweating on the earth while exercising your purpose will ensure you produce a nourishing life long harvest that will also inspire and feed countless others. For me, I connect again over and over to my own purpose each time I choose to lead and collaborate, ensuring that first my own garden is tended too, because only then I am most connected to how I can truly be of service to others and the world. How do you elevate and inspire other women? One of my favorite things to do in the entire world is to mentor and collaborate with other women leaders. It is truly part of my life's purpose and what I feel the world needs more of. When we diverse women reach out our hands and hearts to inspire and support the evolution of those females around us, we are truly unstoppable. Since the dawn of time, women are the community members who have the most influence over their families, their friends, their villages and their workplaces. Because of our true nature to give, raise, support and take action with those around us, we women are the real influencers. Therefore, if we each are healthier, stronger, braver and more connected to our own truth, we can selflessly carry that limitless energy out into the world. One circle of influence at a time, we will create positive change. I live and breathe to be surrounded by, to be a mentor to, and to truly be one of the legit GAME CHANGERS. What would you like to see shift in our community? I define my own community as far beyond the town I live in or my close circle of friends & family. As a female business owner, coach and influencer, athlete and teammate, mother, wife, sister, aunt, nana and friend, my community circle is massive and I am so grateful. The shift I would like to see most in this nationwide community at large is a movement towards simplicity and self investment. I am working towards living a life with less stuff and more connection. I feel that most humans (including myself) have gotten lost chasing and collecting things instead of experiences and that is a waste of time and resources on this earth. I also feel that humans (and I learned this one the hard way) put more value into investing in money-work and relationships with others before themselves and their own bodies. This is a true crisis of both health and happiness in the world. One we can not afford to fix, because when we self-invest we are more productive, more powerful and more able to really live the purpose driven life we deserve. 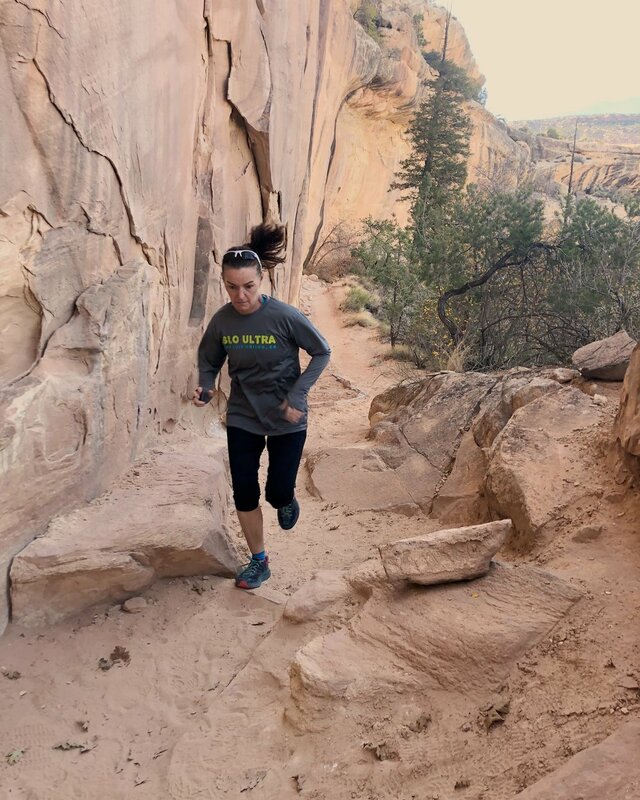 Samantha Alderton Pruitt is an entrepreneur, endurance sports race director, ultra-endurance and adventure athlete, podcast host and lifestyle coach. Established in 2008 to bring world class sporting events to the beautiful California Central Coast, the Race SLO family of events includes the SLO Half Marathon, Half Relay and Family 5K & Kids Races plus NEW SLO YogaMusic Fest (Spring) as well as the NEW SLO County Ultra Games & the SLO Ultra Trail Races (Fall). Race SLO sponsors community run & fitness training programs, supports sporting event projects nationwide, produces a health & fitness blog, plus hosts the popular Endurance Town USA Podcast, all while raising funds for local nonprofits: Jack’s Helping Hand, The Land Conservancy of SLO, SLO County Parks and Grizzly Youth Academy. Over the last 10 years, Race SLO has helped raise and donated over $250,000 to nonprofits in our community.